Governor’s Cup-A Late Christmas Present! This time the wind wind cooperated a bit. The first attempt at a 2011 Governor’s Cup was blown away by 40+ winds. But the second attempt turned in to a beautiful “late” Christmas present. A sunny “Boxing Day” brought early light winds, and then a nice breeze showed up after midday to push and pull our “marathoners” and their boats north and south and around Lake Pleasant along their 26-mile journey. A few boats finished near dark (5:30pm) but several were still up in or near Castle Creek and finished in the dark. 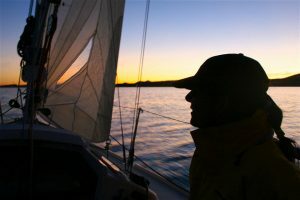 Thanks to the reflective tape on the “reef” buoys and the building late breeze around 6pm the late finishers had a safe trip to the finish cruising along at 4-5kts under a star-lit sky. 2012 Birthday Regatta – Get READY!